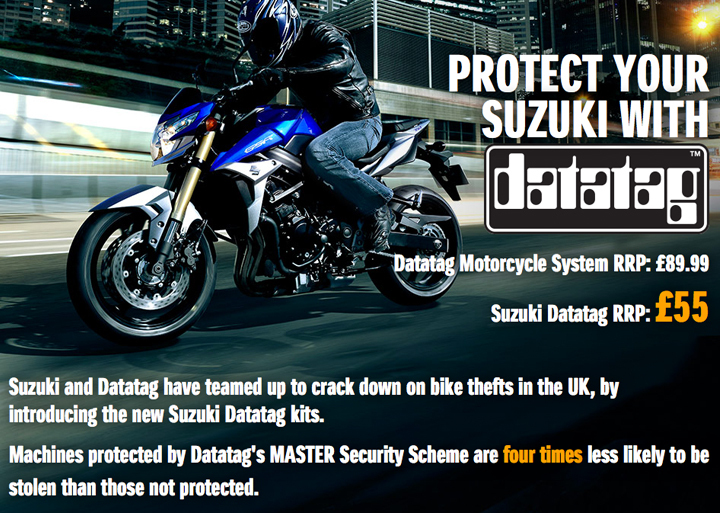 Following the resounding success of the industry-backed Master Security Scheme in association with Datatag, Suzuki GB has announced the launch of its own Datatag scheme for used Suzuki models too. Launched in 2013, the Master Scheme utilises the proven security technology developed by Datatag, bringing it to virtually every new motorcycle sold as standard in the UK. Since its introduction the impact of the scheme has been felt with only 403 machines reported as stolen, out of the 52,687 fitted with the system, effectively making an equipped machine four times less likely to be stolen when compared against figures for unmarked bikes. Suzuki GB's Paul de Lusignan commented, "The impact of the Master Scheme has been felt right across the industry, from manufacturers to insurers and of course most importantly, with customers. While we are very proud to be part of this initiative for new bikes, we wanted to make sure that all of our customers have this chance of extra protection. Thanks to great cooperation between Datatag and our dealer network, we can now offer this to all Suzuki owners at a subsidised cost of just £55 including fitment." 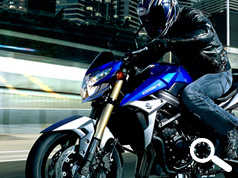 To arrange fitment of Datatag to your Suzuki, please contact your local authorised Suzuki dealer. Datatag utilises state of the art identification technologies to permanently mark and protect your Suzuki. Datatag makes your motorcycle or scooter identifiable to the Police in such a way that is virtually impossible for a thief to defeat, therefore the risk involved in stealing this marked machine becomes high to the criminals who tend to avoid stealing in the first place. Datatag has made a major impact on reducing theft and the Crown Prosecution Service has a 100% successful prosecution rate when evidence has been supplied by Datatag.